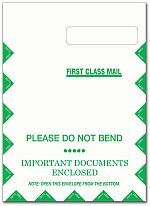 The Traditional #10 Claim Envelope (4 1/8" x 9 1/2") holds up to 12 Claims. Window Size is: 1 1/8" x 4 1/2". It is positioned 4" from the left and 1 3/8" from the top. Available imprinted with practice name and address in top left corner in either black or blue ink. Beachley Business & Medical Forms, Inc. Copyright © 2014 All Rights Reserved. | Website Design by NetVision, Inc.